Whether you are on the lookout for the latest in stand-up, improv nights, workshops, satirical debate, comedy or cabaret, our roundup of comedy venues in London offers tips from the well-known classics to best kept secrets. For all those Edinburgh shows you heard about but missed, or to catch the best up and coming acts in the comedy world, Soho Theatre is the place to check out. With a festival style schedule, and two shows across their three spaces every day, you can make a whole night of it. Soho generally program a mix of theatre, comedy, and cabaret, and are particularly good at finding things that bridge the gap between all of these to exist in a new hybrid spot. They also have a very cool bar where you can celeb spot, or see acts scribbling away new ideas with a pint. This pub in Fitzrovia has had a comedy renaissance of late, with the incredible feat that was The Objectively Funny Festival over the summer, and the club’s continued residency, alongside the programming that has transformed the pub into a hub of the best acts on the circuit. There are comedy nights with a difference too, like satirical debate night 3 Line Wit and Tone of Voice, where comedians improv advertising. Most of the ticket sales go to various charities, so you’ll be supporting live comedy and making a difference. The Albany is at 240 Great Portland Street, London, W1W 5QU. 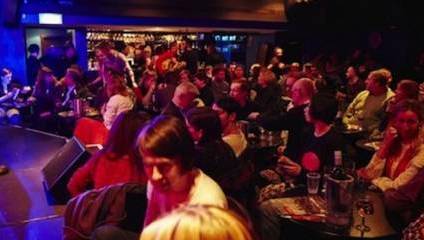 For comedy every night of the week, in a room above a pub (the way it should be done, we would argue) Angel Comedy Club has gigs at both The Bill Murray and Camden Head, and offers a whole host of double bill nights, improv nights, and even workshops for the budding comics amongst you. We particularly recommend checking out their Work in Progress nights, as a chance to not only see your fave comedians on the cheap but also to see the mechanics behind what will surely end up being award winning shows. Angel Comedy Club can be found in The Bill Murray and The Camden Head. Find out more about The Alternative Comedy Memorial Society here. One of the venues that ACMS often has shows at is The Phoenix in Cavendish Square, but that’s not all this pub has to offer. The Phoenix is also home to Old Rope Comedy, as well as podcast recordings from the likes of Pappy’s and Do the Right Thing. Old Rope is on every Monday night and watching the podcast recordings means you get to see all the behind the scenes fun that won’t get put into the finished product. The Phoenix can be found at 37 Cavendish Square, W1G 0PP.